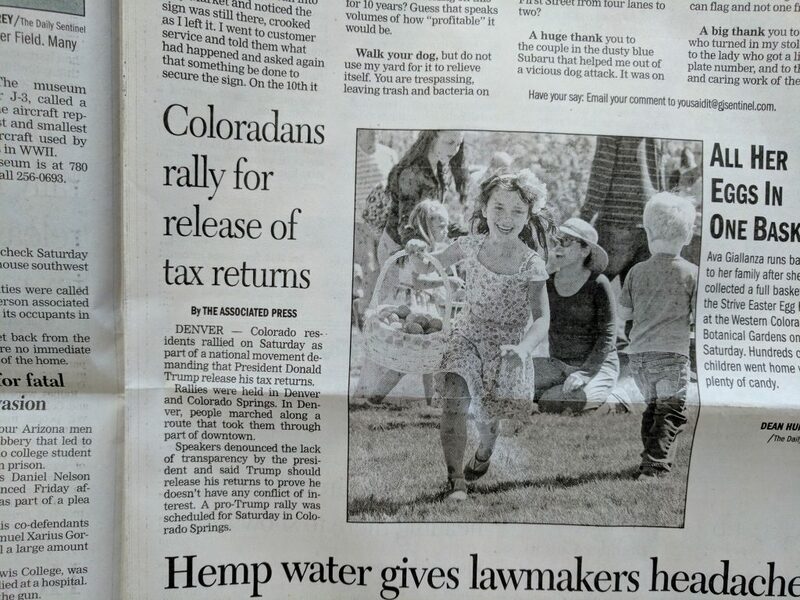 The small article to the left of the photo is the only “coverage” the Sentinel gave to a Tax Day march against President Trump keeping his tax returns secret from the American people, and it doesn’t even mention Grand Junction. The photo right is of a child at the Easter egg hunt at the Botanical Gardens. Almost 300 people marched through downtown in Grand Junction. Sometimes, what newspapers don’t cover is as important than what they do cover. Today’s Daily Sentinel is a case in point. Hundreds of people marched in the streets of downtown Grand Junction on Saturday, April 15 yelling and protesting President Trump keeping his tax returns secret from the American people and claiming they don’t care, and the Sunday April 16 issue of the Grand Junction Daily Sentinel carried no coverage of it at all. Zip. The only article in Sunday’s Sentinel about any Tax March at all was on page 3 of the first section, right below the “You Said It” column, and it mentioned Tax Marches held in Denver and Colorado Springs, but contained nothing at all about the big march in Grand Junction. This is the reason I don’t purchase the local paper. If there are 260 people protesting for ANY reason ANYwhere that’s news.